Hashtags (they look like this: #word or #phrase, eg #Event2015) are the easiest things to search because they form clickable links (click on one and you’ll be taken to the search results page for that tag). If you’re using a phone or tablet app you’ll probably see all of the hashtagged tweets with the most recent at the top but if you’re viewing on desktop Twitter you’ll probably be shown the Top tweets for that tag first, and you can click ‘Live‘ to see ALL of them. To search for anything on a Twitter third party app you’ll likely have either a search box or a magnifying glass symbol which will bring this option up. For really detailed searches I recommend using the desktop Twitter version which has all the bells and whistles. 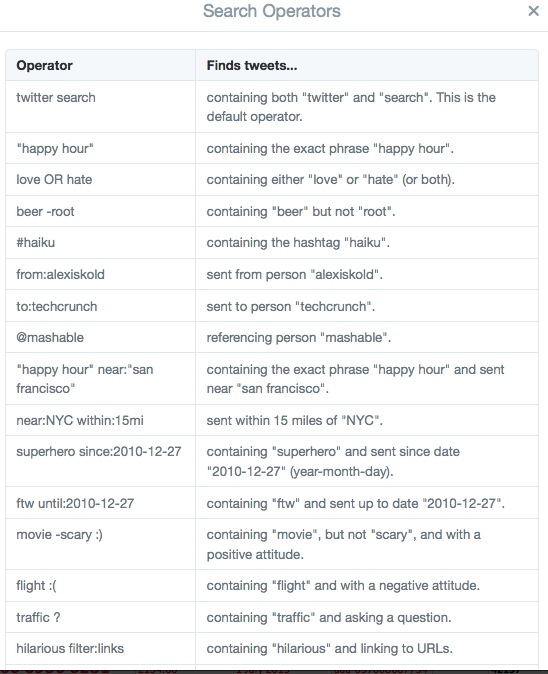 Advanced search is at https://twitter.com/search-advanced and the list of operators (eg how to modify your search best) are below. You can adapt the search string to find tweets sent from:username to:someoneelse keyword to find all tweets sent from one account to another on a particular topic.